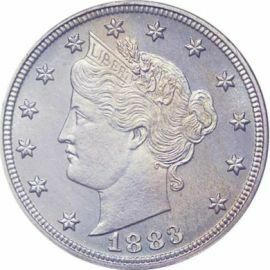 The 1883 Liberty or V Nickel "No Cents" variety was the first type coin of the Liberty nickel series. The "No Cents" design is well known due to the famous Racketeer episode. 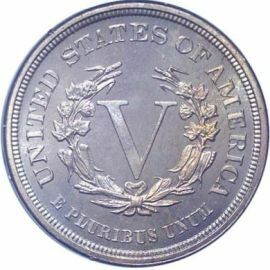 The coin does not denote if it is to be five cents or five dollars, only a "V" for its denomination. Unscrupulous individual’s gold plated these nickels with the hopes of passing them for a half eagle rather than a nickel. Examples of the "No Cents" variety are quite common today, even in Mint State grades. portrait of Liberty wearing a crown. The headpiece has the inscription "LIBERTY" on it and the entire portrait is surrounded by thirteen stars. The date of issue appears below Liberty as well. The reverse of this liberty coin has the Roman numeral "V" for its denomination within a wreath. The inscription "UNITED STATES OF AMERICA" is above and "E PLURIBUS UNUM" is below the wreath.